Halloween isn't just for the tiny, trick-or-treating set. If you're looking to host an adults-only Halloween bash this year, try out some of these sweet and savory recipes from Food and Wine, geared toward adventurous, grown-up palates. Serve your guests this menu, and you will guarantee your party turns out to be a hair-raisingly delicious good time. Sautéed shallots and feta cheese flavor this simple spread, which is a classy hors d'oeuvre at any time of year. 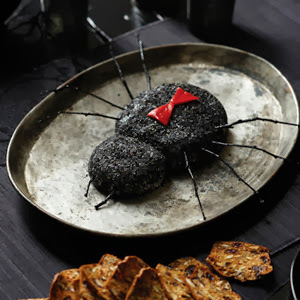 Here, it's formed into a spooky spider and gets its dark hue thanks to black sesame seeds. In a medium skillet, melt the butter. Add the shallots and cook over moderate heat, stirring occasionally, until softened, about 8 minutes. Scrape the shallots into a food processor and let cool. Add the goat cheese, cream cheese, and feta, and puree until smooth. Scrape the cheese into a bowl and refrigerate until chilled, about 30 minutes. Shape one third of the cheese mixture into a ball and roll in black sesame seeds to coat; shape the remaining two-thirds into a larger ball and coat with black sesame seeds. On a serving board, press the balls together to form the head and body of a spider. Cut the piquillo pepper into 2 small triangles and place them on the body in an hourglass shape. Serve with crackers, flat breads, or bread sticks. Spray two mini muffin pans with vegetable oil spray. In a large saucepan, combine half of the marshmallows with 2 tablespoons of the butter. Add the chile powder, cumin, coriander, and 1/4 teaspoon of the salt, and cook over moderate heat until the marshmallows have melted. Stir in enough orange food coloring to dye the marshmallow orange. Stir in 3 cups of the rice cereal. Spoon the mixture into the muffin cups and pack it down with lightly oiled hands. Wash and dry the saucepan. Add the remaining marshmallows, 2 tablespoons of butter, and 1/4 teaspoon of salt and cook over moderate heat until melted and smooth. Pour half of the melted marshmallow into a heatproof bowl and stir in 1 1/2 cups of the rice cereal to make the white layer. Add the cayenne and yellow food coloring to the marshmallow in the saucepan and stir in the remaining 1 1/2 cups of rice cereal. Using lightly oiled hands, mound the yellow mixture on top of the orange layer, packing it down to firmly attach it. 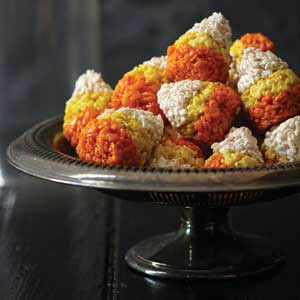 Top with the white layer, tapering the mixture to a point so the crispies resemble the conical shape of candy corn. Serve or store overnight in an airtight container. This is Dark and Stormy, a classic rum and ginger beer drink. Floating ice cubes have an uncanny resemblance to eyeballs. In a small saucepan, bring the lychee syrup and ginger to a boil. Remove from the heat, cover, and let steep for 30 minutes. Meanwhile, stuff 16 lychees with brandied cherries. Set each lychee in the cup of a mini muffin pan or in an ice cube tray. Strain the lychee-ginger syrup and pour it over the lychees. Freeze until firm, at least 4 hours. Meanwhile, in a pitcher, stir the sugar into the lime juice until dissolved. Add the rum and refrigerate until chilled, about 1 hour. Unmold the lychee ice cubes into a small punch bowl. Pour in the lime-rum mixture. Add the ginger beer, stir gently, and serve in ice-filled glasses. Grace Parisi's cake pops are easy to make: Crumble store-bought pound cake; mix with lemon, sugar, and butter; then shape into mounds. 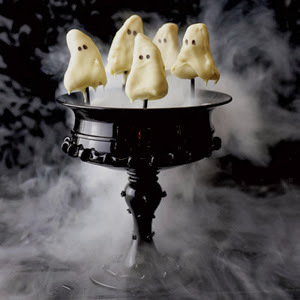 When they're covered with white chocolate, the cakes look like ghosts. Make their faces with an edible decorating pen or dots of black frosting. In a large bowl, beat the cream cheese with the butter, 1/2 cup of the confectioners' sugar and the melted chocolate. Crumble 1 1/2 of the warm cake layers into the bowl and beat at low speed until incorporated. Roll level tablespoons of the mixture into 3 dozen ovals, tapering one end to shape the nose. Arrange the mice on a wax paper–lined baking sheet; press a toothpick into the tail end of each. Refrigerate until firm, 30 minutes. Meanwhile, preheat the oven to 275 degrees F. Crumble the remaining 1/2 cake layer and spread on a rimmed baking sheet. Bake for 30 minutes, stirring frequently, until almost dry. Very finely crush the crumbs. In a microwave-safe bowl, heat the white and extra-bittersweet chocolate together on high power until three-quarters melted. Stir the chocolates until completely melted and cooled to 90 degrees F on an instant-read thermometer. Working quickly, and using the toothpick as a handle, dip the mice into the chocolate to coat; let any excess drip back into the bowl. 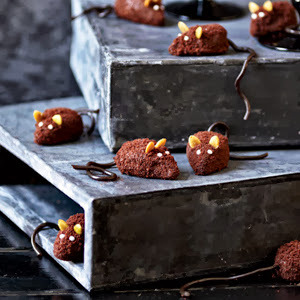 Roll the mice in the cake crumbs and press 2 pumpkin seeds into the heads of each mouse to make ears. Refrigerate until firm, about 20 minutes. In a bowl, combine the remaining 1/2 cup of sugar with water to make a stiff glaze. Transfer to a small plastic bag and snip off a tiny corner from one end. Pipe eyes on the mouse. Remove the toothpicks and insert a licorice whip into each indentation for the tails. 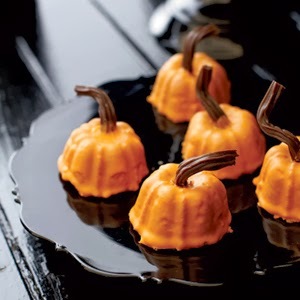 These spice cakes look like tiny pumpkins when they're covered with orange glaze and topped with a piece of dark licorice, twisted to look like a stem. These web-topped, chocolate-frosted red velvet wonders are filled with a spooky surprise — a sweet and creamy filling loaded with chewy tapioca pearls. Preheat the oven to 350 degrees F and line 24 muffin cups with paper liners. Spray the paper liners with vegetable spray. In a medium bowl, whisk together the flour, cocoa powder, baking soda, and salt. In a small bowl, whisk the buttermilk with the red food coloring, vinegar, and vanilla. In a large bowl, using a handheld electric mixer, beat the sugar with the oil and eggs at medium speed until combined. Beat in the buttermilk mixture until blended, then beat in the dry ingredients at low speed until smooth; scrape down the side and bottom of the bowl as necessary. Pour the batter into the prepared cups, filling them two-thirds full. Bake in the upper and lower thirds of the oven for about 30 minutes, until the cupcakes are risen and a skewer inserted in the centers comes out clean; shift the pans from top to bottom and front to back halfway through baking. Let the cupcakes cool slightly in the pans, then turn them out onto a rack and let cool completely. Bring a large saucepan of water to a boil. Add the tapioca and boil, stirring, until softened but still slightly chewy, about 15 minutes. Drain the tapioca and cool it under running water; shake dry. In a medium bowl, beat the butter with 1/2 cup of the confectioners' sugar until fluffy. Add the Marshmallow Fluff and beat until smooth. Fold in the drained tapioca. In a medium bowl, whisk the remaining 1 cup of confectioners' sugar with a few teaspoons of water to make a white glaze that is loose enough to pipe. In a small saucepan, bring the cream to a boil. Remove from the heat and add the chocolate. Let stand until melted, then whisk until smooth. Transfer the chocolate frosting to a shallow bowl. Fill a pastry bag fitted with a 1/4-inch plain tip with the tapioca filling. Poke the tip deep into the center of each cupcake and pipe in the tapioca filling; wipe off any filling that oozes out of the top. Dip the tops of the cupcakes in the chocolate frosting, then stand the cupcakes upright onto a baking sheet. Fill a pastry bag fitted with a fine tip with the white glaze. 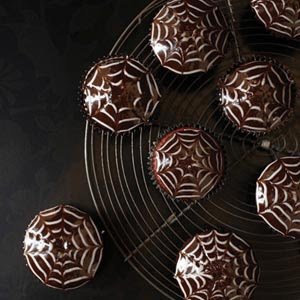 Pipe a fine spiral or concentric circles on the top of each cupcake, then drag the tip of a skewer or toothpick from the center outwards to form the spider web design. Let the frosting and glaze set before serving.